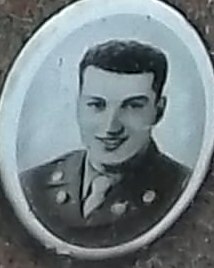 TECHNICIAN FOURTH CLASS JOSEPH L. DiBARTOLOMEO was born on December 10, 1926 to Maria and Antonio DiBartolomeo. His father had served in the Italian Army as a private in the artillery, and had been wounded twice, before being discharged. He emigrated to America in 1916, arriving at Ellis Island on October 15, 1916 aboard the Duca D'Aosta. He first settled in Boston, but by he had married and come to Camden. The 1927 Directory shows the family at 542 South 4th Street, with Antonio DiBartolomeo working as a laborer. At some point in the 1930s the family bought a house at 1030 South 3rd Street, where they lived in 1940. By this time Antonio DiBartolomeo had founded a business, Chestnut Coal Company, which was located at 425-427 Chestnut Street and later was known as Chestnut Coal & Fuel Company. Joseph L. DiBartolomeo was the third of seven children, coming after Cataldo (Charles) and Philip, and before Marietta, Rosina, Antoinette, and Anthony Jr. He was inducted into the United States Army on September 21, 1945 and after completing basic training was sent to Germany as a member of C Troop, Second Constabulary Squadron. This unit, known during the war years as the Second Cavalry Reconnaissance Squadron, was a component of the Second Cavalry Regiment, whose mission was that of maintaining general military and civil security and assisting in the accomplishment of the objective of Military Government in the U.S. occupied zone by means of an active patrol system backed by a mechanized striking force in reserve. Charged with the task of providing police services in the American zone of occupied Germany, and in patrolling the border with the Russian zone, led the Second Constabulary into dangerous situations in the years after the end of World War II. Between dealings with criminals an encounters with the quite hostile Russians, there were a number of instances where shooting was involved. The 2nd Constabulary Squadron was headquartered in Bad Tolz, Germany, about 60 miles north of Innsbruck, Austria in the Bavarian Alps. Technician Fourth Class DiBartolomeo died on January 11, 1947. The circumstances of his passing are not known to this writer as of November 3, 2014. 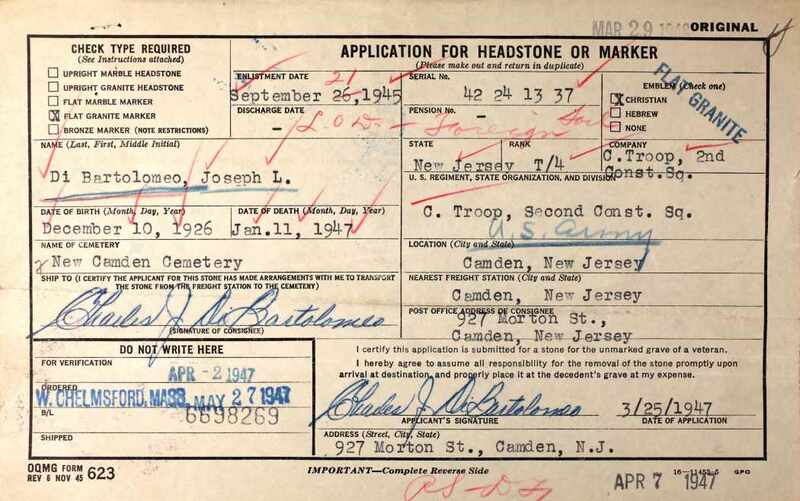 He was brought home to New Jersey and buried at new Camden Cemetery, where he was joined in later years by his parents and older brother Philip, who had also served in the United States Army. 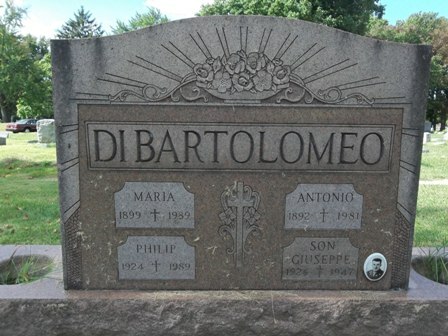 The DiBartolomeo family later moved to Pennsauken, New Jersey.